At North Hem, we love to find and source new and inspiring products. 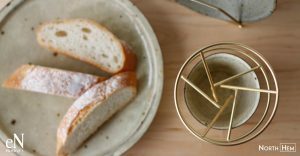 As you can see from our new Dinnerware Collections, we are introducing some inspirational and aesthetic designer products. And these products are great, including our coffee line, enProduct. What is your preferred way to start the day? A robust cup of richness or something more mellow? The day’s beginning sets the tone for everything that follows. Quality, simplicity, and performance are important. 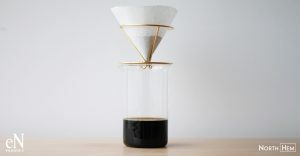 Begin well with a perfect cup of pour over coffee, made to your own exact standards, simply and beautifully. You’ll be prepared for whatever the day brings you. Perhaps your kitchen employs natural materials and straightforward fare. You prefer clean lines with a minimum of clutter or complexity. 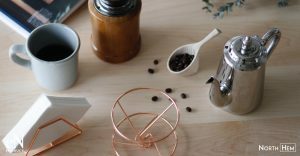 Your morning coffee doesn’t have to diverge from this theme with a complicated compilation of countertop chaos; enjoy your java while maintaining visual and aesthetic harmony in your home. 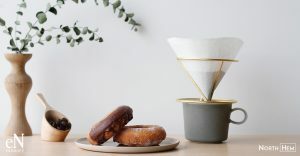 If your mornings are full of conversation and bustle, feeding the children or catching up with the business of the family, simplify preparation with pour over coffee. Your cup will be tailored to your preferences, and other family members will enjoy the ease of customizing their own cup. 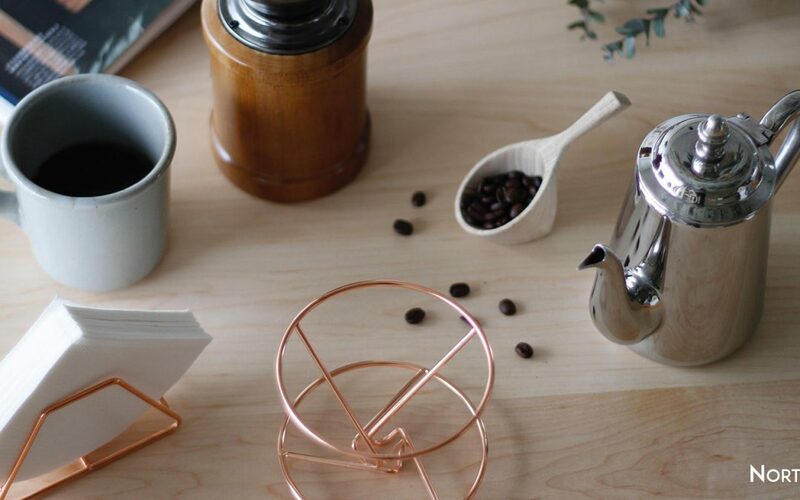 Sip and chat, without the tedious cleanup of a French press or the wasted caffeine of a large pot. If you’ve finally managed to procure yourself a leisurely morning, enjoy your coffee perhaps with an indulgent pastry on the side. Page through your favorite design book or finish the novel you’ve been lost in. Sit back and take your time, because a restful moment and a perfect coffee both deserve to be savored. A home is often more than just a place you live; modern offices are often included in home life. Business owners, freelance workers, and remote workers all have to create a space that is both livable and meets the environments decor. For aspiring home office workers, here are three inspiring images of a well-designed modern office space for the home or even for a corporate building. 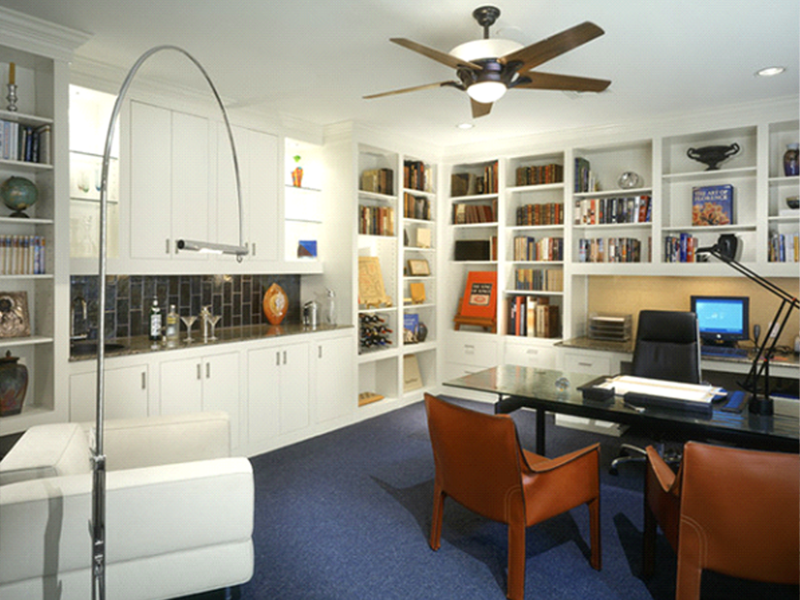 This spacious mid-century room incorporates all the essentials for a marvelous home office. 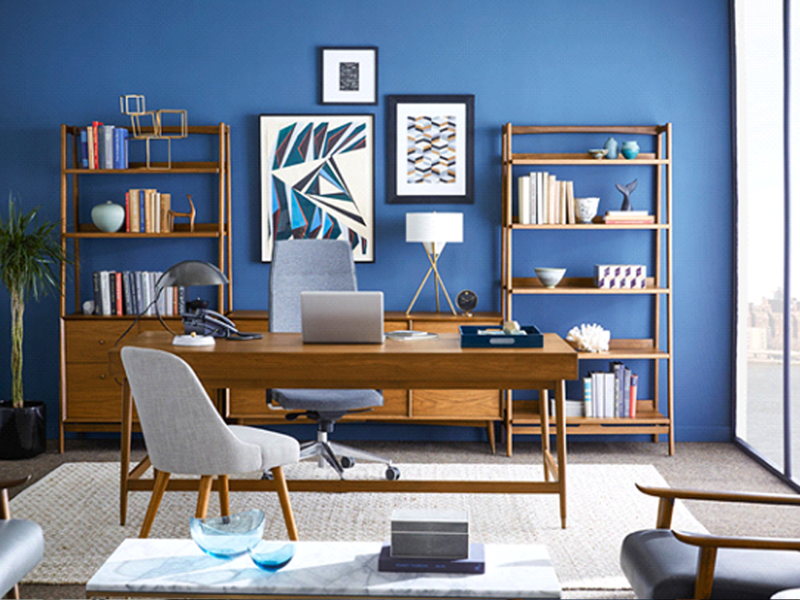 Be inspired under the arch of the modern, polished floor lamp and take care of business in a sleek desk chair. Present your project or proposal to your clients seated in comfortable armchairs, then prepare a martini at the minibar to celebrate a successful venture! Finally, relax in the white lounge chair when the day is done. We love this office for all the right reasons. 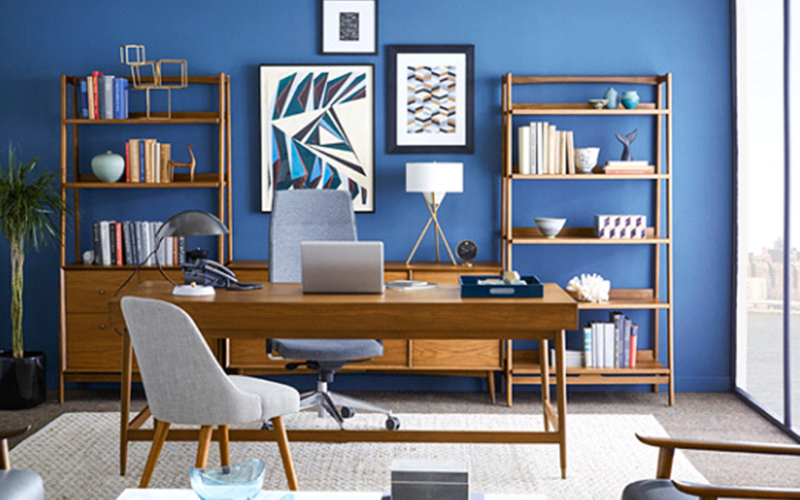 The bold wall colour is a superb backdrop for the mid-century furniture, bookshelves and accessories, and the generously sized desk manages to perform excellently while maintaining a light, open construction. The upholstered mid-century accent chair echoes the lines of the executive desk chair, and the tripod lamp is the perfect showpiece here. It’s hard to imagine a more appealing, yet eminently serviceable office. 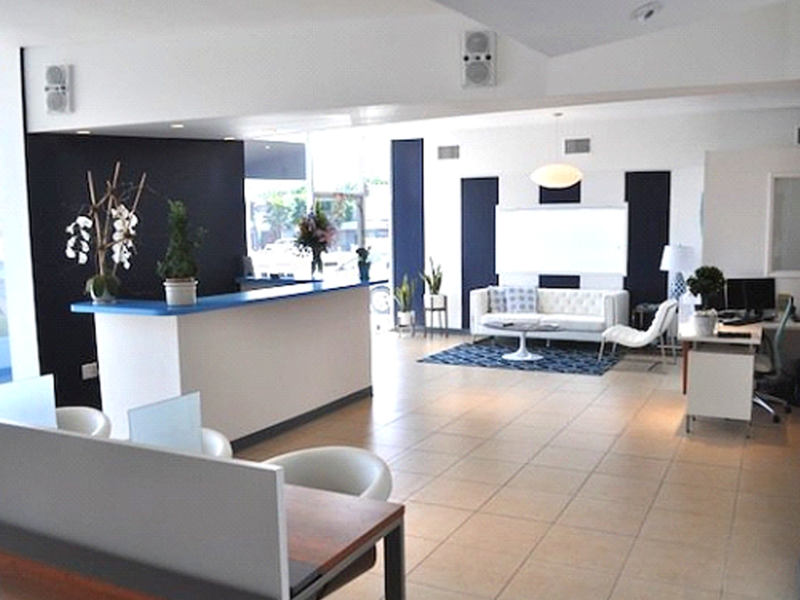 This mid-century modern lobby accomplishes a plethora of purposes. A classic bar-height reception desk boasts a lively space-age blue surface and the colour is repeated throughout the room. There is a posh waiting area, well-defined by a patterned rug and broad mid-century pendant light. Office work has its own unobtrusive place and guests and clients can utilize modest workspace cubicles as needed. An organic touch is provided by the potted plants and lively bouquet in this well-styled, functional space. Interested in More Intellectual Inspiration? Consider the book nooks below.